J.R.R. Tolkien will forever be known as the creator of such memorable characters as hobbits and wizards, and the mythical world of Middle Earth, but he was also a prolific poet. Born in South Africa in 1892, he came to England with his mother three years later for a long family visit, but his father died and they remained in the country. Without an income, Tolkien and his mother moved to the outskirts of Birmingham where the countryside would inspire his later works. For a while he was taught at home and developed a love of languages, learning the basics of Latin. He was able to read by the age of four and had a liking for fantasy books rather than historical adventures like Treasure Island which was a popular children’s classic at the time. Tolkien’s mother died when he was just 12 years old and guardianship of he and his brother was taken up by Father Morgan who would bring them up in the Catholic faith. While a pupil at King Edward’s School in Birmingham, Tolkien became involved in the cadets and joined the Officer Training Corps. As he grew into his teens, he also become more deeply interested in languages and started working to create his own. He married Edith Bratt, went to Essex University to study language and literature, and graduated with a first class honors in 1915. Unlike many of his compatriots, Tolkien didn’t immediately join up on the outbreak of war in 1914 but decided to finish his studies instead. It caused shock and consternation amongst his friends and family though he enlisted once his finals were finished. The day he left for European shores inspired him to write the poem The Lonely Isle. After his training, Tolkien found himself at the Somme at the height of the fighting, creating a special code in his letters home to Edith so she knew where he was and that he was well. In 1916, Tolkien contracted trench fever and was sent back to England. In the following days of the war most of his battalion was killed. Many of Tolkien’s friends also failed to return from the front, something that affected him deeply. Not fit enough to undertake proper military service, Tolkien spent the rest of the war in hospital or working in the local garrison. During a period of convalescence he began working on a series of stories that comprised The Book of Lost Tales. After the war he spent some time at the Oxford English Dictionary and then moved onto Leeds University where he was the youngest ever professor. At the time, he worked on a translation of Beowulf, unpublished until a long time after his death, and toured, giving lectures on the legend. He also worked on The Hobbit and the first two books of the Lord of the Rings Trilogy. 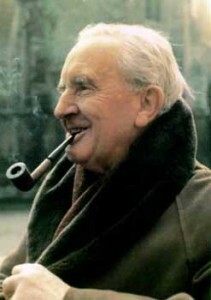 Because of his ability with languages, when World War II broke out, Tolkien, now in his late forties, was initially asked to work in code breaking but was later informed that his services were not needed. Towards the end of the War he moved to Oxford to take up a professorship until he retired in 1959. Tolkien had a wide ranging literary career, far beyond the much loved fantasy trilogy and his creation of Middle Earth, and many of his works were actually published after his death. As he headed into retirement, his books became more and more profitable, earning him a comfortable living. He died in Oxford at the age of 82 in 1971. He was buried at Wolvercote Cemetery next to his wife Edith who had passed away two years earlier.